Nardi Coral, Multistone and Yellow Gold Peacock Brooch. 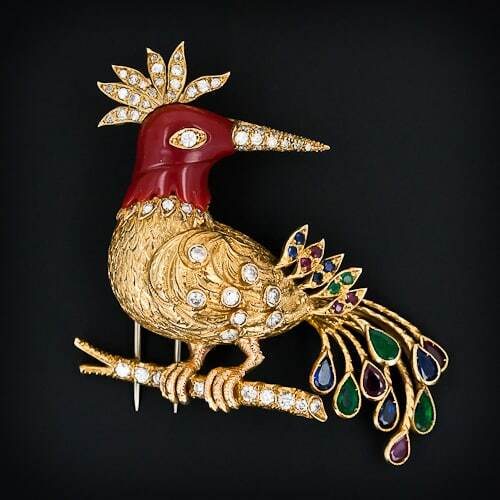 Venetian jeweller famous for his blackamoor or “Moretti” brooches. Carved from ebony or sardonyx, these brooches depict the head and shoulders of a turbaned “Moorish” male—the intended reference is often to Othello, the Moor of Venice, or to the valiant, warlike Hannibal.1 They are typically gem-encrusted and constructed with precious metals. 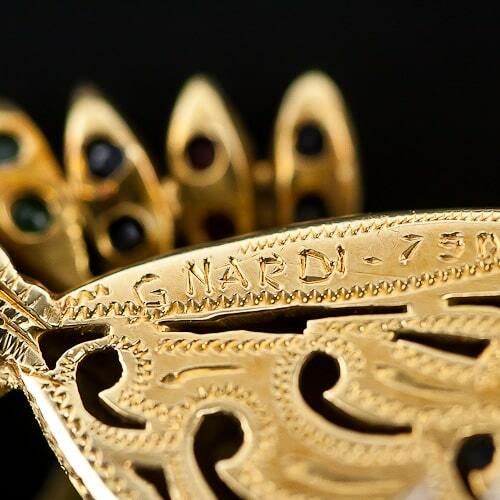 The brooches were originally Venetian souvenirs. In the late 1920’s and early 1930’s, they became wildly popular. 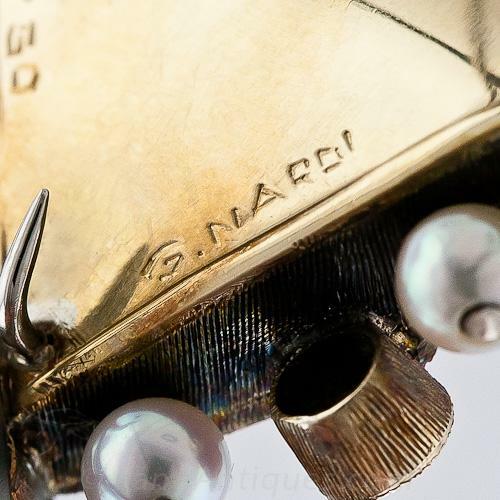 Nardi’s founder Giulio Nardi, who first began producing blackamoors in the early twenties, is known as a master craftsman of them. Though the firm carried and still carries, more than just blackamoors, its fame is largely a result of its founder’s ebony creations. 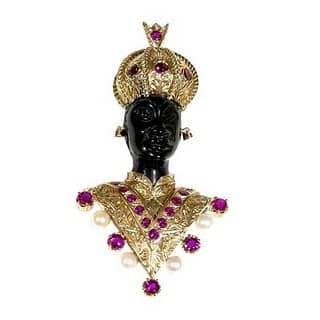 Nardi Blackaboor Brooch with Jeweled Headdress and Collar. Giulio Nardi founded Nardi in the Piazza San Marco. Techniques inspired 18th century Venetian goldsmiths. Began to make brooches inspired by the Venetian Moretto. Alberto Nardi took over from Giulio Nardi. Inspired by Othello – the Moor of Venice a symbol of purity and love. Corbett, Patricia. Verdura: The Life and Work of a Master Jeweler. New York: Harry N. Abrams, 2002. Corbett offers a brief discussion of blackamoors in relation to their popularity in the 1920′ and 30’s.